If I could actually talk with you, I am not sure what I would say. I might just stand in your presence and weep. And then, hopefully without making you feel awkward, I’d reach over and hold your hands and look into your eyes, because I want to see and feel exactly from where those beautiful paintings came. From a young age, when I saw your paintings in an art history book I checked out from the library, I was mesmerized. I knew I was in love with those colors, those subtle changes in light, those lilies, the Japanese bridge, the steam from the trains, even the boats floating in the harbor. I couldn’t keep myself from running my fingers across the pages of the book trying to feel you and your spirit through a print of a print of a painting that was done a hundred years before I was even born. I could sit for hours looking at one painting in particular. It drew me in. It made me queasy with familiarity and love. As I grew older and continued taking art classes, I learned to appreciate other Impressionists, but I kept coming back to you and Mary Cassatt, as my two greatest loves in the art world. Don’t get me wrong, Claude, there are other artists I love, some that you, no doubt, would despise, but you are the one who most frequently steals my heart. You see, every time I think I know everything there is to know about you, or every time I think I’ve seen all of your paintings, I’m surprised by another variation, another subtle difference, another interesting fact about your life. I’d venture to say I’m slightly obsessed with you. 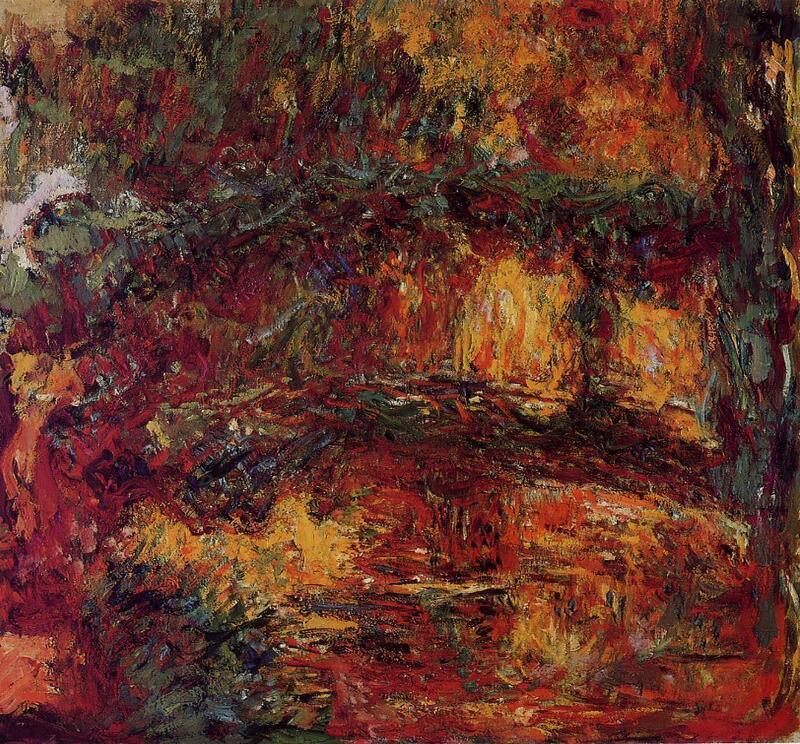 In 1995 the Chicago Art Institute exhibited a collection of your paintings called “Claude Monet: 1840-1926.” I was 21. I made sure I was there to see this collection, and here is where my first surprise about you came to fruition. I’d seen several of your paintings before at the Art Institute, but I was totally unprepared for what I was about see. I’d always read about how large-scale you worked, but it wasn’t until I was in a room, in a familiar art gallery, with several of your painting looming over me, that I realized just how large your paintings really are. They are huge, Claude, HUGE! I was overwhelmed and began to cry right there with all of touristy, artsy companions. I knew this was the largest collection of your works ever assembled in the United States, and I was absolutely overwhelmed. I had seen everything in the exhibit, and was getting ready to leave it when I decided that I’d just walk back through one more time. As I salmoned my way back through the crowd, sort of nonchalantly, so I wouldn’t appear conspicuous to one of the many, many guards who had been employed for this occasion, I realized I hadn’t seen anything even resembling my favorite painting, the one I’d run my fingers across so many times in a book I’d checked out so frequently for so many years. I began to feel a bit sad for myself, even in the midst of all your great works. My painting, the one that touched the very core of me, wasn’t there. Your work brought me to my knees right there in the middle of hundreds of people in the middle of the busiest exhibition to run at the Institute. I fell to the floor in awe and just wept, or more ugly cried, breaking into sobs. I’m can’t control my visceral reactions, which is embarrassing sometimes. I was moved beyond moved. When I finally stood up, my knees were weak, and I looked a mess. I had to resist walking up the painting and reaching out to try to touch you through it. I wanted to feel the textures, smell the paint. I wanted to reach back in time and feel what you felt when you were painting this beautiful work that had been speaking to me for years. So, Claude, there you have it. I’m in love with you through this one painting. Thanks for making my life more beautiful with your art.